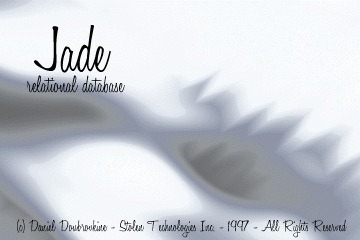 In 1997 I wrote a program called Jade. It worked on Windows 3.1. I can’t get it to run anymore, but I got the image that would hang there until the app loaded – it says Stolen Technologies Inc., a name I’ve used for a couple of ears before creating Vestris Inc. Unlike Vestris, STI was actually never incorporated. Jade was a personal address book manager that let me print labels of my contacts. It had some amazing code. I’ll buy a beer to whoever can tell me what this actually does – I certainly can’t! I am glad it didn’t work out. I can’t believe that this was almost 15 years ago. Blast From The Past: Jade was published on September 06, 2011 . See a typo?